These A level guides will help to successfully develop the higher-order thinking skills that the top-achieving A-level students possess. 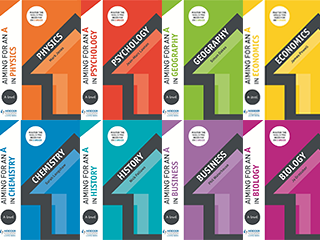 These revision guides can also be used as year-round course companions and cover 9 A-level subjects including History and Physics. These guides will help students reach the results they deserve. Included within these guides are practical exam tips, examples of common pitfalls to avoid and revision strategies guide students towards the highest grades. Find out more and request Inspection Copies by clicking on your subject below. Our sample pages show how the features in Aiming for an A will hone the skills and technique to score highly. Each book supports the major exam boards – AQA, Edexcel, OCR and WJEC/Eduqas – with coverage of the relevant Assessment Objectives. Sample responses are annotated to highlight the key features of A/A* answers – so students know exactly what they need to do to improve. Practical exam tips, examples of common pitfalls to avoid and revision strategies guide students towards the highest grades. Aiming for an A develops the skills of analysis, evaluation, creation and application – and shows students how to apply those skills to achieve an A/A*. Further reading tasks stretch towards university-level study, encouraging independent learning. Find what you need to know, when you need it, with key facts at your fingertips for your A-level subjects.